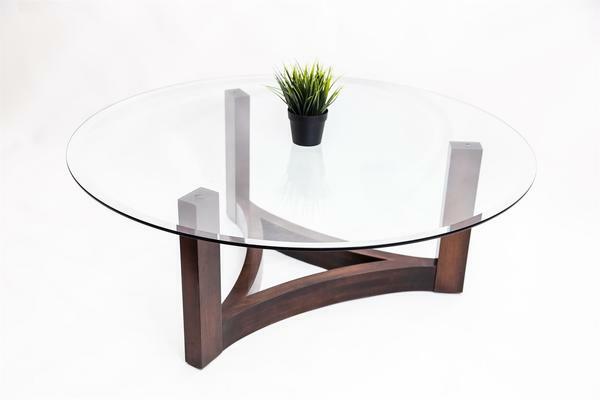 Give us a minute -- we are taking in the beauty of our contemporary Amish West Bend Glass Top Coffee Table. While we are sure this table would still look lovely with a solid wood round top, we just can't imagine cover up that angling base with its curves and three post legs. This glass-topped coffee table is a work of art that will stand out in your living room while adding functionality as a spot to place food, drinks, remotes, plants, and more. Custom options of this accent include your choice of three diameters, wood type, and finish. Diameters: 36", 42" or 48"